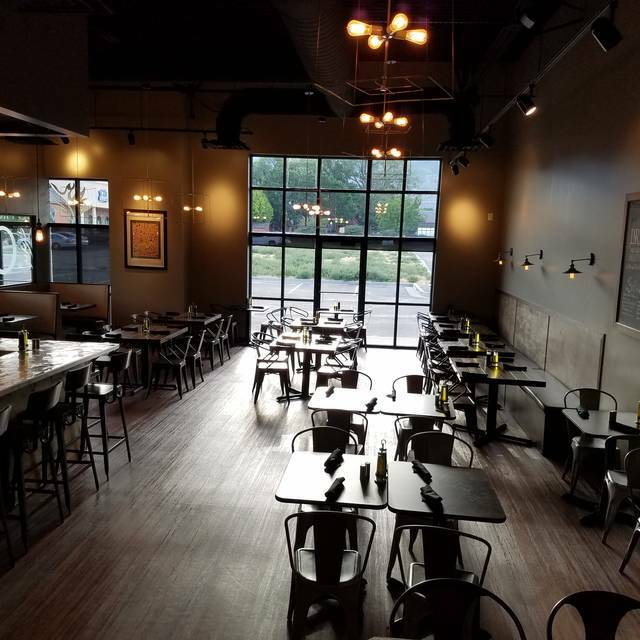 OAK Wood Fire Kitchen by Restaurateur Michael McHenry & Chef Brandon Price brings Eclectic, Wood-Fired Craft to the Heart of Draper Utah. Featuring Live OAK Fired Neapolitan Pizza's, Handmade Pastas, Inventive Small Plates and Seasonal Entrees. Artisan Cocktails, Natural Wines, Local & Domestic Beers. Open for lunch, Dinner and Sunday Brunch. Put a little fire in your belly! 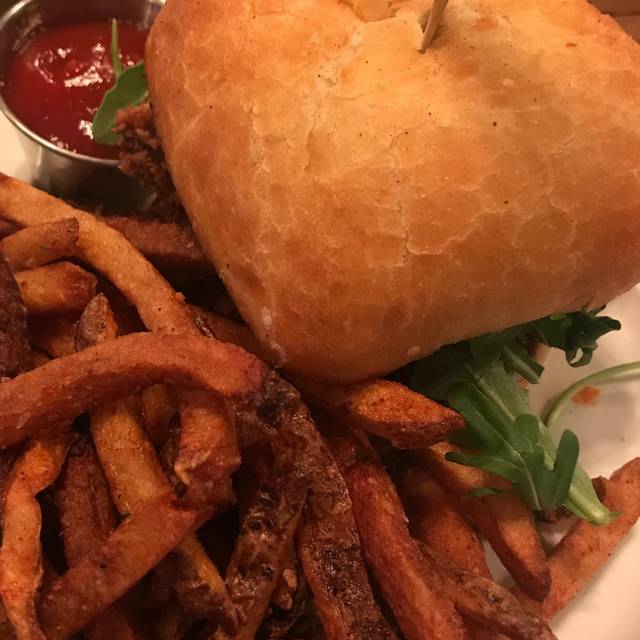 Awesome food with options that aren’t like the standard brunch options in the area. The staff is always super friendly and knows a lot about the menu. Our new favorite! Many of my company ordered the Carbonara dish. It was really weird to include cream and corn. Tasted fine, but was odd for a carbonara dish. Pizza crust was burned. Who wants to eat burned crust? We continue to be pleasantly surprised at the food choices at The Oak. Chief Brandon is amazing. We watched him make fresh noodles for Italian dishes at the side counter. It was an fun education. Friday night we had the Meatball appetizer. 3 biggie "delish" meatballs that were a meal in themselves. WOW then our main course was the Salmon Wedge Salad with the house dressing. Could eat it all. Great atmosphere, food value and food. I recommend Lunch, Dinner or casual evenings with terrific beverages at The Oak. You are surrounded by great fun people. Fabulous dinner. Everything was amazing from appetizers to dinner !!! Loved the cauliflower app and the goat cheese app. Tried this out for my husbands birthday lunch. The fried cauliflower is amazing and I like that the menu is different than anywhere I’ve ever been. Also appreciated the gluten free pizza crust choice. Average everyjthing, along with service. The host was not friendly and failed to check me in with Open Table, which made them contact me to verify I was there. We went to Oak with out of town family. A party of 10. 8 of us ordered pizzas, 2 ordered salads. After about 25 minutes, 3 pizzas came. These pizzas were all barely warm. Did not taste like they just came out of a 700 degree pizza oven, more like they were sitting on the counter for the last 10 minutes. The Margherita pizza was soggy and floppy. After another 10 minutes, 3 more pizzas came. These pizzas were hot. The Big Chair was flavorful. The waitress did not come back for about 10 minutes, and only realized they forgot 2 peoples pizzas when we told her. It took another 15 minutes for these 2 pizzas to come. And when they arrived, they were visibly black and burnt. I would normally have complained to a manager on the spot but didn't want to make a big deal with family there. They had live music which was cool. But it echoed incredibly, making it almost impossible to chat during our dinner. Our waitress seemed distracted and too busy to really take care of us. The arugula and prosciutto salad and the carbonara was excellent. We would recommend this restaurant. I was so annoyed by the noise level I'm sure I won't be back. The food was okay, but not good enough to make up for it. We also had great service with a full-time server and a trainee. I unfortunately didn't get their names, but they were pleasant, funny, and efficient. We had an awesome time here, food was amazing and super filling. We can’t wait to come back and try more things! Wonderful food, especially the Baked Goat Bread, Tagliolini Bolognese (hand made pasta made on the spot), and save room for the Skillet Cookie, it's amazing! We ordered take-out many times before dining on site. Great food either way. Don't take my word alone, try it--you'll like it. The food tops everything else! We had the meatball appetizer and the Margherita pizza, it was delicious! But the noise level is really loud. So, if you can put up with the noise the food is worth it!! Great food, Great Service. A hidden gem that isn't so hidden anymore. We eat at The Oak once a week. The food is all fresh and has a unique twist to the taste. Hearty size. The best Pizza in town! Steaks to Salmon. Great beers and several wines to choose from. Management friendly servers are excellent! It really is a hidden gem. Can recommend everything on the menu. Great food and the live music was an unexpected treat! Excellent service by Jaime. Food was wonderful. We both had the Wedge salad. Delicious! Food is fabulous--salads, sandwiches, soups, pizzas, pastas...This is a favorite in our neck of the woods! The food is amazing. It’s a very lively atmosphere. The employees are engaging. Everything about this is a five star except the noise. Because it’s so open, you here everything. It was hard to carry on a conversation. The open seating is accommodating to a lot of people but takes away from the privacy. I felt the price was a little steep for the atmosphere. I have a girls night coming up and for the food it’s my number one pick, but to catch up with friends, not my first pick. That’s the only drawback for me. Again...... FOOD WAS AMAZING. One of our fave local spots. Great new menu. But often one person’s meal comes out way later than the others. Service was really good! Food was fine, but overpriced for what it is. It was a nice evening out. Great night out with my husband, amazing service, food was top notch. Love this place. Great neighbourhood restaurant. Excellent food with an explosion of taste. Highly recommend it! Chef Brandon knows how to add flavor to healthy and comfort foods alike. The fried cauliflower, crostino and wedge salad are my favorites! The pepperoni pizza with honey melts in your mouth. We had a table of 4 and 2 entrees came out and then 10 minutes later another one came out and then about another 3 to 4 minutes and the last one came out. Service was mediocre at best. Finally a decent restaurant in Draper! Food was fantastic, price was very reasonable. Very friendly staff. The chef came out and introduced himself as well. If I could make one suggestion, I would love to see attention around softening the lighting a bit but otherwise, loved it! We will be back soon. Had the chicken parm sandwich. Hardly any meat on it. Mostly breading, sinew, and joint pieces of chicken. Loved the old menu and preparation. New menu seems to be cutting costs and using cheaper quality. Friendly staff, good environment. Great restaurant- with a awesome waiters and cooks! We loved sitting up by the bar and talking to the chefs! Delicious baked goat cheese starter and the best brick chicken large plate! We loved it- will be coming back for sure! I took a big group to OAK this week and loved it. Its about time Draper got a non-chain locally-owned fun place like this! They were short staffed on Wednesday but the manager was very attentive and didn't charge us for one of the pizzas when the entrees came out slowly. Highly recommended!! The food has really gone downhill lately. We keep trying to go back and give it a try because we like the ambiance, but we have tried almost everything and the only things that are consistently good are the appetizers - goat cheese and cauliflower. So sad - I want to love it :( There was live music the other night when we went. The singer was great - just a little too small of a space - seemed LOUD. Service was a little slow, but waitress took great care of us. Seemed a little pricey for what was offered. Food was ok nothing special. Service unbelievably slow. The junk fries were awesome!